MY DOG! 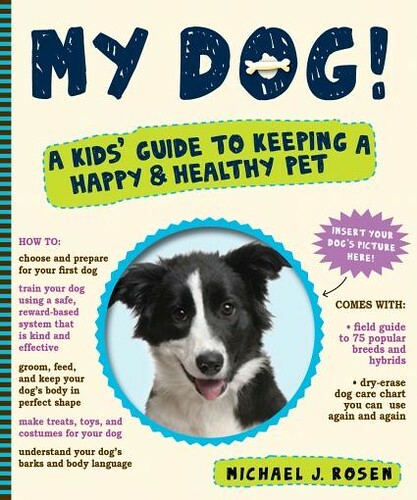 A Kids' Guide to Keeping a Happy & Healthy Pet is the perfect companion book for every child who has - or wants - a dog, whether it be a brand new puppy or a beloved family member who's been around for years. Designed for children 8 and up, this guide book meets owner's manual meets scrapbook is both kid-friendly and parent approved. Every child wants a dog, but too often than not, they - and their parents - don't understand the responsibilities that come along with adding a new member to their family. My Dog! teaches the essentials of feeding, grooming and training - all with the sensibilities of an energetic, eager-to-learn child in mind. My Dog! presents the information in a clear, unintimidating and entertaining manner. The colorful, interactive layout is fun for kids (and kids at heart), keeping their attention and peaking their interest to learn more. Plus, My Dog! features a customizable cover (slip a photo of the child's own best friend in the die-cut frame), pages for notes, doggy report cards, a pull-out dry erase dog care chart and a full-color guide to 74 dog breeds! Author Michael J. Rosen explains why it was important for kids to be involved in training their pet... "Dogs and humans are both social creatures, and the more time we spend in each other's company, they more both creatures benefit. For kids to fully engage with their dog and reap the many rewards of this companionship, they can't simply 'help' with the feeding or walking. And they certainly can't be subjected to the daily frustrations of 'He keeps pulling!' - 'She got away again!' - 'He won't listen!' - 'She chewed my notebook again!' Kids need a role in the overall training so that the dog is comfortable, safe and obedient with everyone in the family. Playing games, grooming and turning the everyday walk into an adventure are more fun ways for the whole family to bond with your dog." I couldn't agree more with Michael. Far too often there are issues within families with dogs and children that could be easily prevented and overcome with a little training and understanding. Every child deserves an obedient best friend and My Dog! helps make that happen. About the Author: Michael J. Rosen has written, edited or illustrated several books, including Kids' Best Dog Book, Dogs We Love, Horse People, Fishing with Dad and My Bug. Many of his anthologies have supported humane efforts through the Company of Animals Fund, which he founded in 1990. Michael lives in central Ohio with his pack. Great review! Would love to get this for my girls!! This would be an awesome book for M & E. I might have to see about ordering that one. :) They think their little buddy is most awesome, so I can see them really getting into that book and putting some of the suggestions to use.